There is so much talk about the benefits of Asparagus in treating Cancer, I thought I would add my thoughts to this discussion beginning with the fact that there is no known scientific proof that Asparagus has any benefit in treating or eliminating Cancer. It is scientifically known that Oxidation/Oxidative Stress is definitely a cause or a major contributing factor to Cancer. The U.S. National Cancer Institute also reported that asparagus is the food that contain evidence of highGlutathione, an antioxidant that is considered one of the most active and powerful in the fight against aging and prevent cancer. Glutathione is a small protein consisting of three amino acids: Cysteine, Glutamic acid and Glycine. Glutathione is involved in detoxification. It binds to fat-soluble toxins such as heavy metals, solvents and pesticides. Therefore Glutathione provide protection against certain cancers. 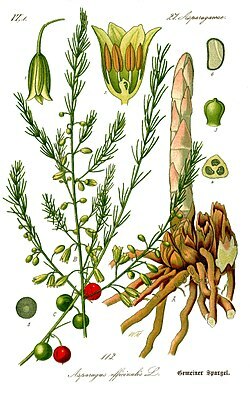 The elements of Materia Medica’, edited in 1854 by a Professor at the University of Pennsylvania , stated that asparagus was used as a popular remedy for kidney stones. He even referred to experiments, in 1739, on the power of asparagus in dissolving stones. Note the dates! Nutrition studies have shown asparagus is a low-calorie source of folate and potassium. Its stalks are high in antioxidants. “Asparagus provides essential nutrients: six spears contain some 135 micrograms (μg) of folate, almost half the adult RDI (recommended daily intake), 20 milligrams of potassium,” notes an article in Reader’s Digest Research suggests folate is key in taming homocysteine , a substance implicated in heart disease. Folate is also critical for pregnant women, since it protects against neural tube defects in babies. Studies have shown that people who have died from Alzheimer’s Disease have extremely low to no levels of folate. Several studies indicate getting plenty of potassium may reduce the loss of calcium from the body. Particularly green asparagus is a good source of vitamin C. Vitamin C helps the body produce and maintain collagen, the major structural protein component of the body’s connective tissues. Furthermore, Vitamin C can also be an anti-oxidant but not as powerful as glutathione. So the moral of the story is believe no one and educate yourself enough so you will want to try anything with common sense! !